It is in the island of Pamvotis lake and was founded on the 15th century. It is a historical preservable monument. 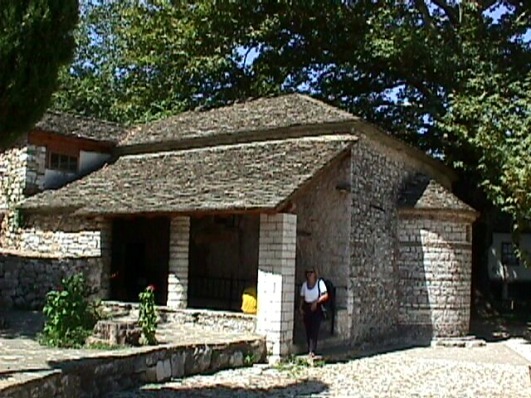 Inside the monastery was written the end of the life of Ali Passia of Ioannina, who was sieged by the forces of Choursit Passa and under the orders of Sultan, who characterised him as a rebel. So Ali Passia hid here and in the end he was beheaded in 1822. He was in the middle cell when he was shot αfrom the basement and the bullet injured him in his belly. It is also obvious the point where the bullet passed through the floor. Lady Vasiliki who was with him, was sent away and lived until her death at the village Aitoliko of Aitoloakarnania. Her grave is still saved behind the chuch of St. Taxiarches in Aitoliko. From the monastery are still saved the temple, the renovated building of the library and three cells which have been converted into a museum of greek history before the revolution (in the museum there are a lot of weavings, jewels, vessels, etc.). The monastery was burnt in 1822 but it was rebuilt in 1925. Its temple is basilica of three spaces and a wooden roof. It has also a magnificent wooden iconostasis and a hall outside it. The main church is separated with columns in three spaces. In the outside space there are maginificent wallpaintings of the 15th century. There are also many significant portable icons of the 15th and the 19th century.